Four members of the Riley Creek wolf pack, including the matriarch, “Riley,” dig a moose carcass frozen from creek ice in May 2016. National Park Service trail camera photo. Klauder is a wildlife technician at the park. She had a garbage bag draped over her because there was a dead wolf curled on a steel table nearby. She was about to examine it. That wolf — not the one I saw — had died deep within the park. Klauder and wolf biologist Bridget Borg would perform a necropsy to see how the young female died. 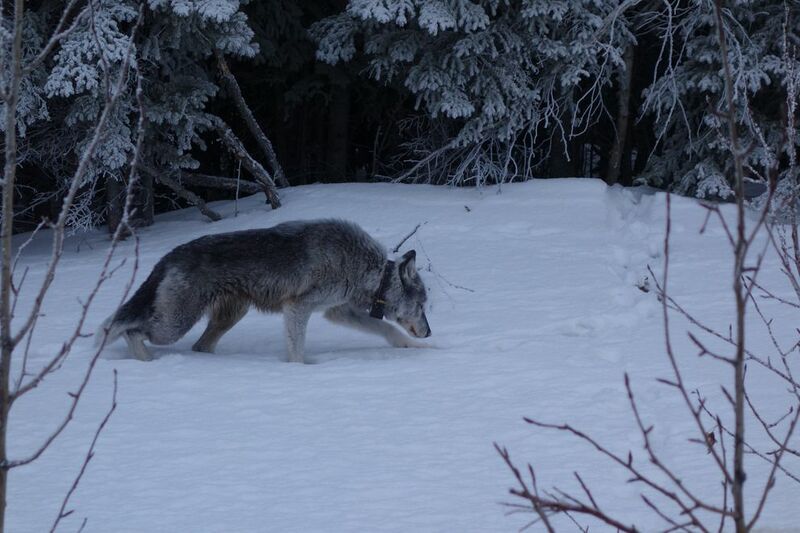 The biologists identify the wolf I saw as 1202, the “12” signifying when they first captured the female and fitted her with a satellite collar in March, 2012. Bridget Borg, Denali’s wolf biologist, said that thanks to that fist-size collar that transmits a blip to a satellite every six hours, they knew the life history of wolf 1202. For this story, I have named the wolf Riley. Born in May, 2009, Riley first saw sunlight after crawling from a hole dug in the roots of an old spruce above the Teklanika River. Foreshadowing Riley’s future, her mother was a dominant wolf who led the East Fork pack for a decade, giving birth to a few dozen pups over the years. Assertive wolves like Riley’s mother are the ones that breed, that fight, that have the ability to pull down a caribou with their mouths. Other pack members still hunt and fight, but don’t make decisions for the group, or breed. Some, wanting independence, take off, which is a high-risk, high-reward scenario. By autumn of the next year, Riley did one of the most dangerous things a wolf can do: she split. Biologists call this dispersing. Any wolf out on its own is at great risk of death by other wolves. It is one of the top two natural reasons most wolves won’t die of old age. The other is starvation. Interested in this new development so close to park headquarters, park biologists darted and collared her mate, a black, muscular male who was, at 3 years old, two years Riley’s junior. I’ll call Riley’s mate Midnight (rather than 1406). Riley turned 6 in 2015. Biologists noted her coat was “dark blue” and she again denned within the same burrow in the hill not far from the park road. She had five pups. Many visitors to the park saw Riley and her pack; the animals chose to meet often in a spot that was visible from the road. Riley’s pack challenged the wolves of the Grant Creek pack, which hunted on neighboring lands to the west and south. The Grant Creek pack was 12 strong, but the Riley-led pack of 14 was too much. “It’s all very Game of Thrones out there,” Klauder said. A 9-year-old female wolf with a satellite collar limps alongside the highway near Denali National Park in February, 2019. Photo by Ned Rozell. The Riley Creek pack had almost doubled its acreage of boreal forest, high mountains, graveled riverbeds and tundra hillside. The wolves needed it to satisfy the need for about 2.5 pounds of food per wolf each day. (That’s an average; wolves can go a week without food, then gorge on 20 pounds of moose in a day). In January, 2018, Riley’s mate, Midnight, died there. His last location was along a known trapline. “That was the beginning of the end (of the Riley Creek pack),” Klauder said. Riley persevered without her mate. A trail camera recorded her chasing a wolverine from her pack’s moose kill in February, 2018. What happened to the other members of the pack? The biologists don’t know.